Day 2 of 3 of Sac-Anime is the sole "full" day of the convention, and thus the busiest. I didn't exactly intend on it, but I ended up waking up around 6:45 AM, as my room crew slash CCB colleagues made plans to go to this local dinner called Jim-Denny's. 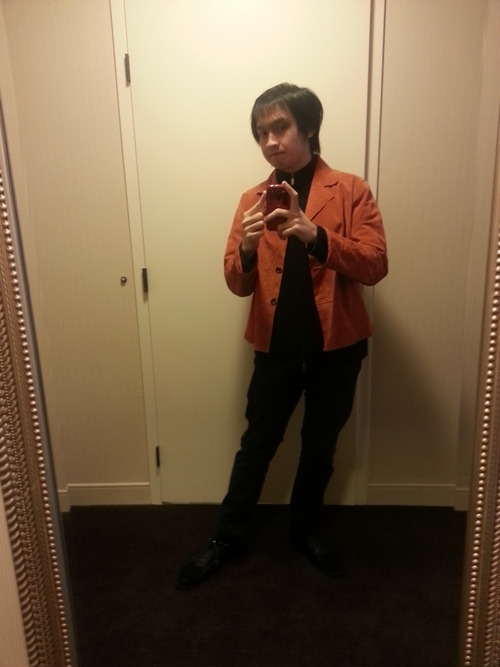 With no time to actually get into my Reimu cosplay, I just threw on my Yukki jackets and Minato pants--Yukki if he cared about how cold his legs were, if you will. We left for the place around 7:45 AM. The diner is this small, construction-trailer-sized building with two rows of seats. Some of the decors inside were old-fashioned, showing food prices from the days when one USD could buy you a meal or two. 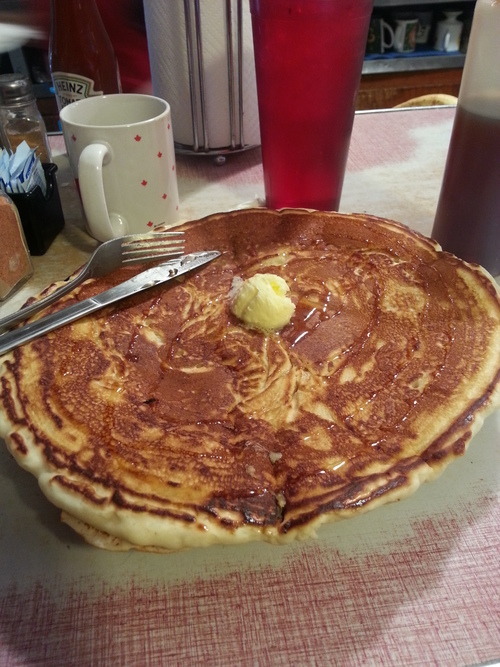 Nate and I thought about splitting the infamous Hubcap pancake, but even for two people it would be too large, so we just ended up ordering our own separate meals. 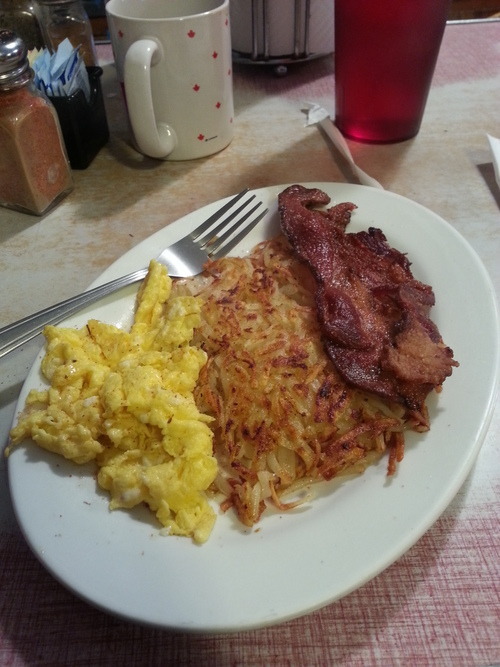 I got the AJ's combo--in my case, scrambled eggs, hash browns, bacon, and one "mini"-sized pancake. After stuffing ourselves silly, I made for my car to retrieve my umbrella, as we were expecting rain later today. 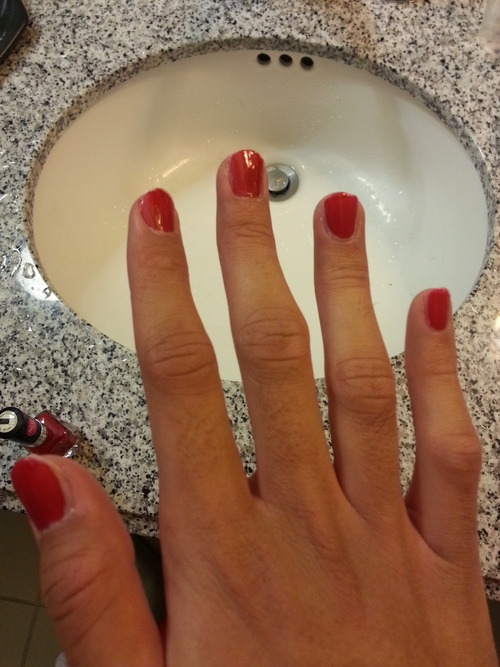 Then I went back to my hotel and get dressed for my shrine maiden duties in my Reimu cosplay. I thought about putting on my white scarf a la Silent Reimu, but my wig hair kept getting caught in the scarf so I decided to just leave my scarf behind. Maybe when I get a shorter wig. As I left the room, Robbie pointed out that his umbrella had to be peace-bonded, so upon reaching the lobby I made for the peacebonding booth and got my umbrella peace-bonded. It's not any of my characters' props, but hey, better safe than sorry (and ejected from the con, which would reflect badly upon myself and CCB). Not a whole lot things of note transpired, really. The gaming room was dense with tournaments for most of today, none of which I cared for, so I effectively had no place there for most of today. 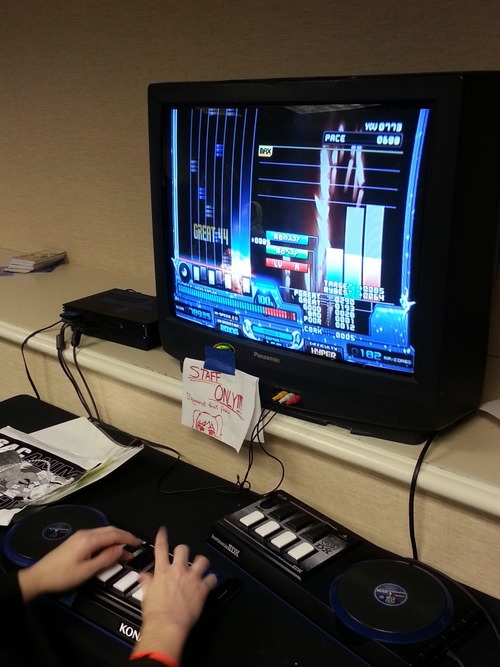 I did manage to squeeze in a few rounds of IIDX and Mushihime-sama ver. 1.5, however. I also examined the viewing room, which was showing Nichijou, so I stayed for about half an episode. I like when viewing rooms show anime I'm interested in, but viewing whole episodes takes up a large chunk of time so I generally do not stay for long. I did meet up with Katie again, who needed to untangle her Hanyuu wig, so I lent her my hair brush while staving off awkward text conversations. 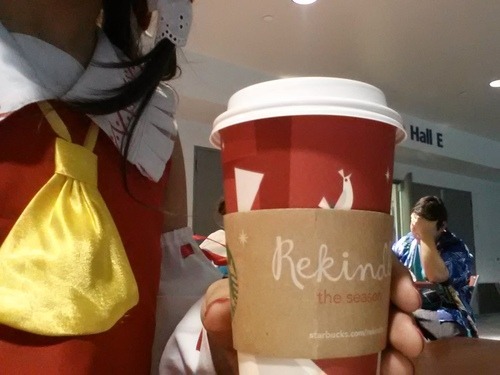 The Madoka gathering was at 5 PM and I thought of attending that, but at the time I was engaged in conversation with someone I had just made friends with, and I was somewhat exhausted from sleep deprivation and enjoying a cup of Starbucks tea two-handed (Reimu is often depicted drinking tea, after all). Amusingly, the barista called me "ma'am" instead of a male pronoun; I just went along with it rather than creating an awkward situation out of it. 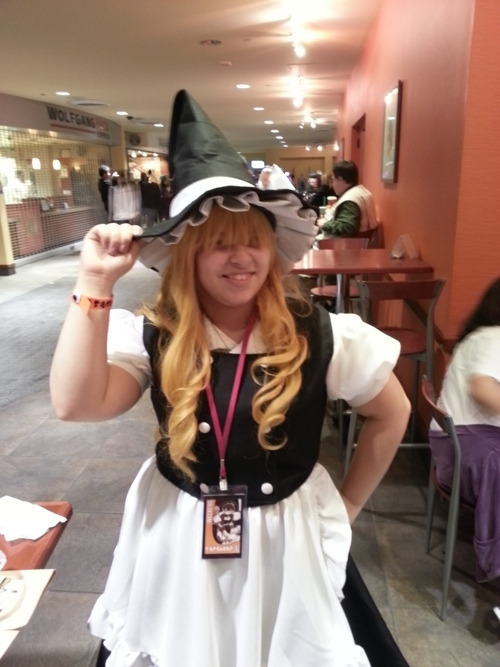 Several cosplayers of interest, a good subset of which were Touhou cosplayers, passed by. so I got some photos. I texted Alex (H.), who decided upon driving up to Sac to visit me and some other friends for a few hours. In the meantime, at 6, I met up with the CCB crew to go out to the Old Spaghetti Factory for dinner, as part of Nate's birthday celebration. We walked the 4 blocks in the rain, and had a 35-minute wait in the restaurant lobby, during which I caught a peek of my friend's friend playing Boyfriend Maker and I played Space Invaders Extreme 2 to pass the time. We got seated, and examined our options. I personally ordered the garlic mizithra, which in addition to the pasta itself also comes with bread, a choice of soup or salad, and dessert. All for only $12. Very much enjoyed the pasta, if a little salty; I might have to pay a visit to the San Jose one at some point. During our dining Alex joined in (walking from the con center to the restaurant in the rain?! ), though since he was late he didn't order any food. Still, it was good to see him again, and we managed to catch up on things. After all was said and done we went back to the con around 9 PM. I was thinking about checking out the convention center, but I was very tired and decided to just camp the 2nd floor of the hotel lobby. Also, my phone battery was at <5% so I needed to recharge. I caught up with some of my Touhou cosplay buddies, and we had some nice chats, although I had entered "critical awakeness failure" mode at this point and was catching chair catnaps at this point. I ended up retreating back to the room to get some rest. 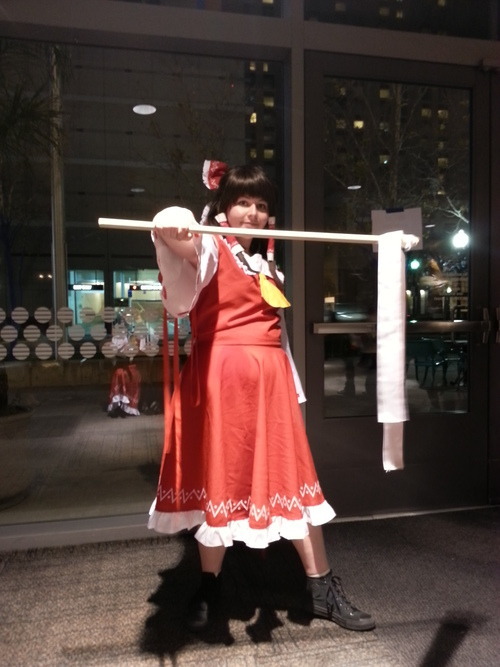 Overall, cosplaying Reimu for the first time in over 2 months was a success, and it's always sad when I have to take the ol' uniform off and revert back to "normal mode"; I've come to appreciate just how much I enjoy crossplaying, something I'm still fairly new to. Regardless, I needed to be asleep ASAP as I had early checkout and a lot of things to do the next day.